Looking Our Best has to admit she is a bit old-fashioned when it comes to jargon. Politicos and economists using terms like ‘copper-fastening’, ‘kicking the can down the road’, ‘double-dipping’ and so on, set the LOB gnashers on edge. Fashion speak has the same effect, with phrases such as ‘killer heels’, ‘directional’, or ‘recessionista’. But hands up here - your blogger has no doubt been guilty in the past of using such jargon during her illustrious career as a hack. (I was young; I needed the money). So here goes with another old chestnut, the ‘must-have’- seemingly updated to ‘lust-have’’. (Please keep up). 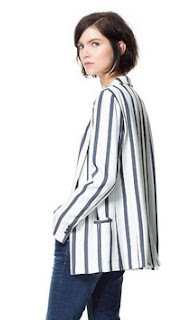 If there really is something every woman, every age, must/lust have this summer (apart from wonderful Wendy’s now iconic pink trainers, of course), it’s a lightweight blazer. Now I know that very word ‘blazer’ conjures up an image of old geezers at the golf club, but a smart, slightly tailored jacket not only dresses up summer shifts, jeans or chinos, it’s also a necessary cover-up in our temperamental climate. If the weather forecast is not dependable, at least you know that come summer, there will always be a choice of jackets in classic tailored style to throw on over any outfit. Also, if the summer sales tend to lead you into the temptation of another ‘of-the-moment’ maxi/dipped hem dress, opt instead for a classic jacket marked down in price as it will prove, as they say, a real ‘investment buy’. Zara is the LOB go-to store for nicely tailored, lined jackets in traditional, but not fuddy-duddy, cut. Their styles usually have buttoned cuffs, allowing for that casual, rolled back sleeve look that can be a bit 'Miami Vice' but nonetheless softens any severe line. Although the Zara sale has been in full swing for a week now, there are still good looking summer designs marked down in price (check online for availability). 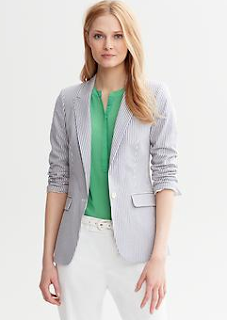 Keaton blazer in natural hemp (similar to antique linen), reduced to £95,Toast. 100% cotton blue striped blazer, reduced to €94.99, Banana Republic. 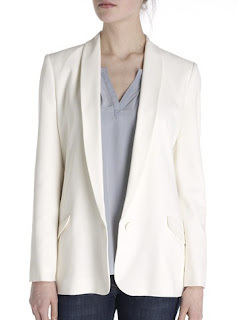 Ivory tailored crepe 'Boyfriend' jacket, £198, Jigsaw. Navy and white longline striped blazer, reduced to €49.99, Zara.